The Directors of Artellite have announced the four winners of this year’s Signature Art Prize, the UK's only art prize dedicated to student and emerging artists. Held at Bankside Hotel on Thursday 31st January 2019, the Gala night showcased the finalists, selected by an expert panels of judges, in the mediums of Painting, Sculpture, Photography & Film and Drawing & Printmaking from over 500 submissions from artists from around the world. Two further winners were announced on the night; following the public ballot, Gala guests selected the People's Choice Winner. Co-Founders Elinor Olisa and Isobel Beauchamp announced their Directors' Pick. All the winners can be seen below. Dorian Radu is a multiple award-winning artist, focusing on realistic and hyper-realistic portrait painting. With over 14 years of experience, he has been commissioned to paint pieces destined to prestigious private collectors such as the Romanian Royal Family, the BBC TV Series “Cradle to Grave”, as well as numerous other prestigious collectors. In 2017, Dorian was selected to exhibit in the Royal Institute of Oil Painters, winning the L. Cornelissen Prize as well. 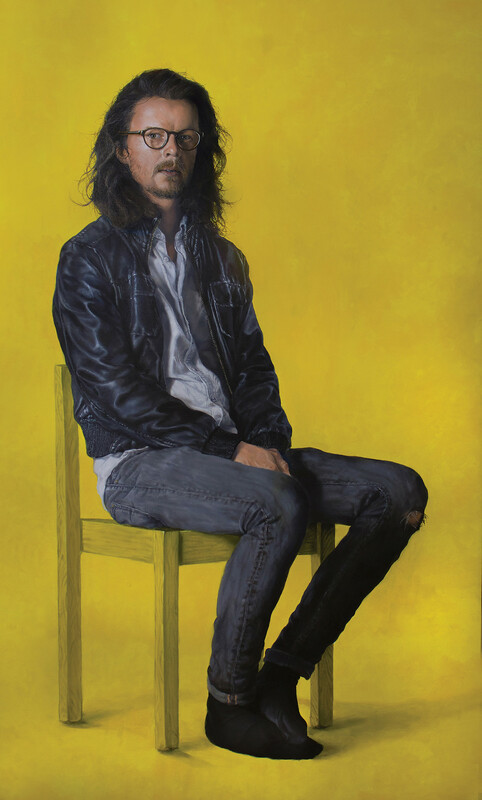 In 2018, his work has been selected for the Royal Scottish Academy OPEN, where both of his submitted pieces were successful. Overall, Dorian’s work is now present in more than 80 private collections worldwide. Dorian Radu'’s art is at a junction between traditional and contemporary principles, in the sense that the main aim is to bring back the aesthetics and criteria of traditional portrait painting and also identify the role of portraiture in contemporary art. For centuries, portraits used to be a baronial symbol of wealth and loftiness. In addition to the former purposes, contemporary portraiture brings along limitless possibilities of questioning and critiquing the perception around the human figure. The artist Ana Sofia Restrepo is interested in documenting stories born from random encounters as a way of directing attention to the quotidian. The little moments which fill everyday life and make it special, but might seem insignificant next to big milestones. 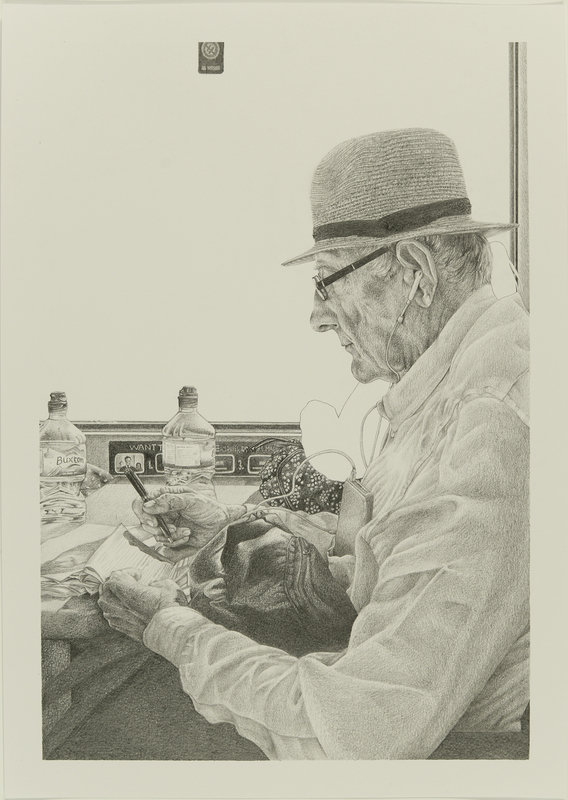 The drawing ‘On the train’ was created after seeing a man traveling on his own to London. He was completely absorbed in something he was listening to, almost unaware of his surroundings. There was a singular contrast between the sense of isolation and the crowded place. However, his was a voluntary isolation, it talked about purpose and enjoyment. In the drawing, the white space in the window and the omission of the passengers, help focus the viewer's attention on the man. Hoping to make them part of the experience shared by the artist traveling next to him. In public spaces, one has the chance to share a few minutes with strangers. There’s a momentary connection, and it is easy to observe each other and get a glimpse into the stories of others. What is perceived and the observer’s interpretation combine to create tales and characters part evidence and part imagination. Tottie Aarvold is an artist and fine art photographer who focuses on the abstract qualities of the world in paint or through a lens. She sees her photographic images as ‘found paintings’, an organic fusing of both the human and natural world. She is drawn to textures, layers and entropy. Her images are of the abandoned and unnoticed, the unusual and random in everyday life. Tottie Aarvold’s work is very personal and involves self-exploration. She has worked for many years as a psychotherapist which has led to her interest in the hidden and revealed, in what lies beneath. 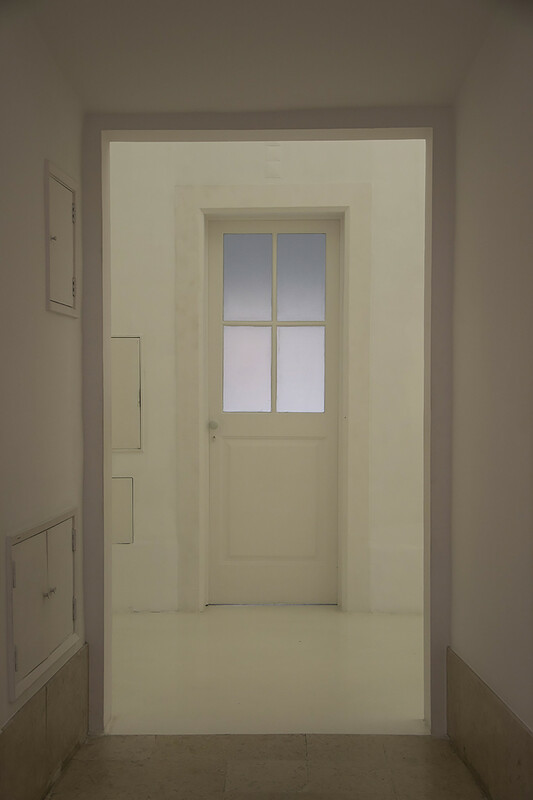 Aarvold creates a story, an uncertainty and psychological confusion in her work. She aims to convey pathos and loss, to show the barriers between reality and illusion. It is important to her that the photographic image is as she saw it, that it isn’t highly manipulated in Photoshop. She uses natural light and never alters a scene. The camera is her eye, it captures what stands out for her in the world. Charlie Lang’s sculptures ride on brute materiality and a floppy sense of humour. With raw materials like concrete, steel, and timber he marries their urban, hard and stern qualities with a bentness, sag, snap and bow. Charlie Lang’s sculptures reveal themselves through a slapstick parody of their materials. They invite our connotations of strength, purpose and construction that we are all familiar with, as building blocks of the biggest man-made objects we encounter; buildings, bridges, roads, etc. These ties to the outside world become part of how his sculptures are shaped in the context of the studio or gallery, by an aversion of wanting to play to the materials usual destinies. How can they be repurposed to fight the reasons they were created? Often when working with the materials a conversation emerges between their exhibition space and their materiality. The scale these materials are used to being laboured with in the world is often at odds with the space available to me. They ask to be bigger than big, and hr responds with regret, whilst stuffing them into what space he can. What results is a monumentality with its belt tightened and a colossal indulgence in daftness and absurdity. In the social media century, we produce and consume content as much as we dispose or forget it. We are in the business of making, not tangible products, but rather alternate personas. Personas which are brands and products within themselves and not unlike everyday objects, are manufactured, commodified, and most importantly consumed. The most consumed — or in other words the most liked and commented — will win the game. The game of the consumable and disposable selves. Rather than to criticise, through this piece the artist aims to open a discussion as well as to further reflect on a phenomenon which she is part of herself. By making the image one which consists solely of emojis, the artist aims to pinpoint these particular pieces in a specific time frame, much like Lichtenstein used the comic book aesthetic to represent the pop culture of his time, Gonzalez Corea is using emojis to represent pop in 2018. Four Transformations a physical materialisation of infrared radiation via photogrammetrically aligned heat signatures. Recent advancements in commercial thermal imaging technologies have encouraged thermography to be embraced in numerous industries; aiding a monumental shift in exploration and experimentation. This year’s winners finalists have been selected by our esteemed judging panel: Award winning Artist Lee Madgwick; London Area Director of the Arts Council England, Joyce Wilson; Co-Founders of Powerstip Studios, Dayna Lee and Ted Berner; Co-Founder and Director of the Institute of Making, Zoe Laughlin; Associate Director of Early European Sculpture & Works of Art at Christie’s, Milo Dickinson and Business Development Director at Jones and Jones, Kate Jones. Founded in 2007 and now in its 9th edition, the Signature Art Prize is the only award of its kind that aims to promote the work of artists in the very early stages of their careers. Drawing attention to the unique perspective of students and recent graduates, the prize champions their signature themes and aims to bring their work into the spotlight. The prize is open to all artists currently studying, and those who have graduated from an arts-based degree within the last 3 years. 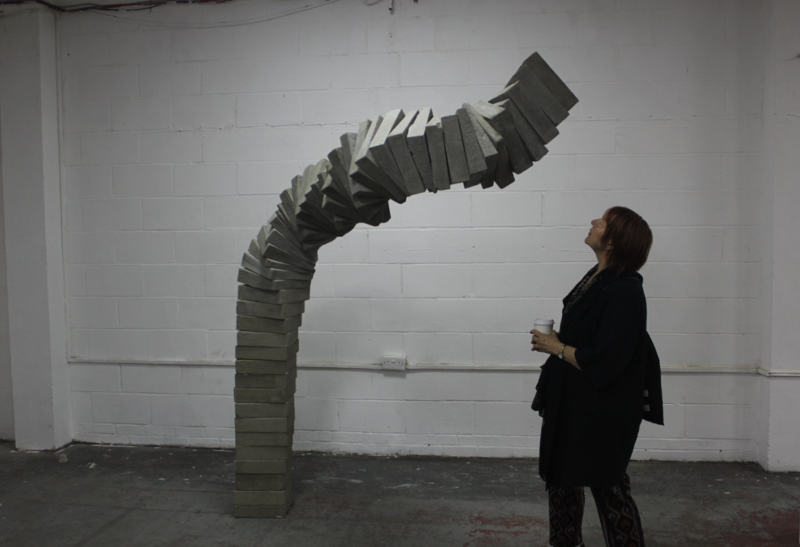 The Shortlisted Artists comprise of: Ana Sofia Restrepo, Su Bonfanti, Joshua Redican, Martha Oatway, Carol Wilhide Justin, Tessa Maudlin, Lizzie D'Alessandri, Robyn Litchfield, Alexandra Roddan, Ottelien Huckin, Dorian Radu, Tottie Aarvold, Emily Osborne, Gareth Sell, Ella Husbands, Yang Xu, Maria Positano, Tom Beardwell, Diana Burch, Charlie Lang and Natanya Barrett. The People's Choice Winner will be selected from the finalists on the Gala night. This prize provides all shortlisted entrants a chance to exhibit at the gala and following exhibitions.